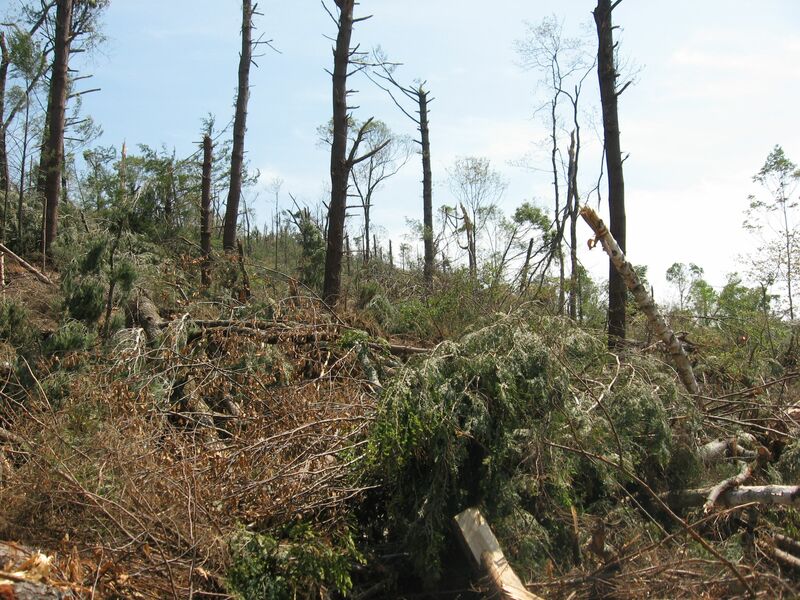 TREES TWISTED, CRACKED AND BROKEN IN PIECES, THE TORNADO LEFT A PATH OF DEFORESTATION IN ITS WAKE. 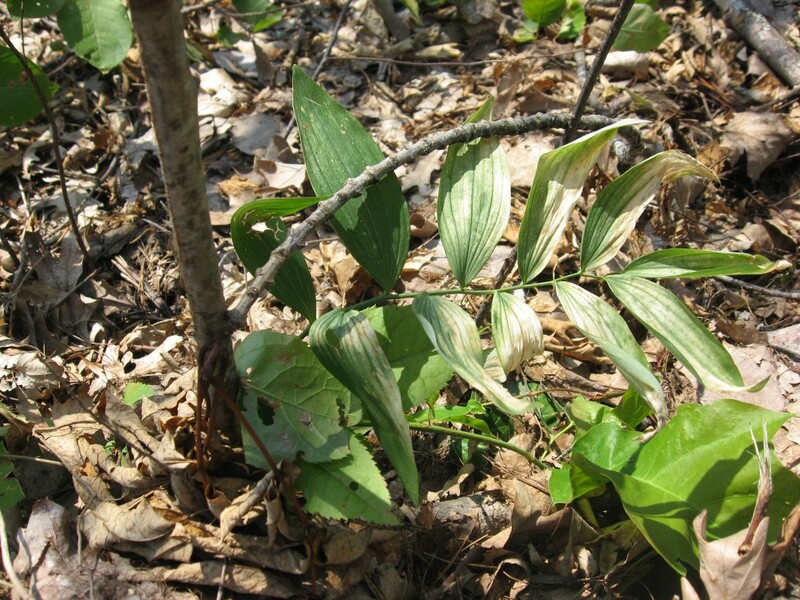 HERBACEOUS WOODLAND PLANTS GROWING IN THE ONCE SHADY FOREST WITHER IN THE SUN. Part II of the special coverage of the Massachusetts tornado by Sanguine Root staff writer Sean Solomon. 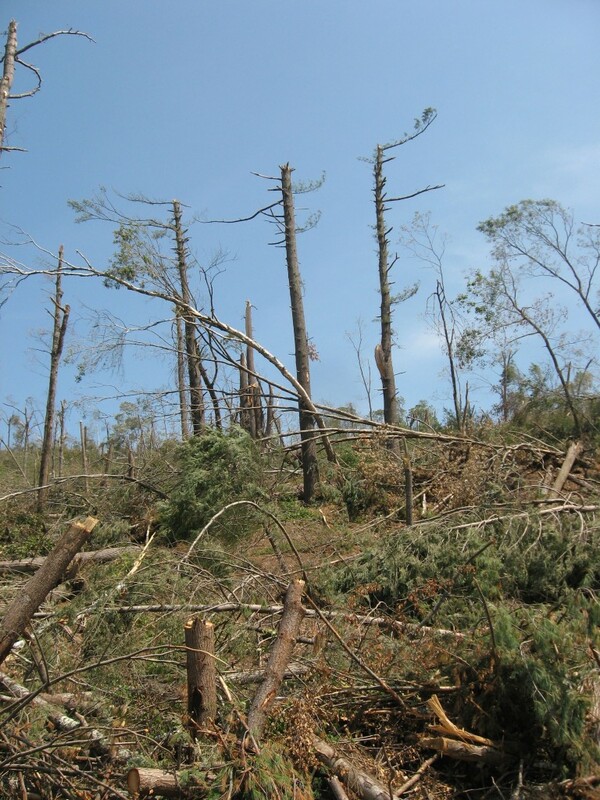 The path of the tornado reached its peak width in the Brimfield State Forest. To see this was a shocking sight. This has always been a shady, wooded area, so thick with trees that it was dark and mysterious, and was the quintessential forest for me as I was growing up. To see this destruction is unsettling. These trees were part of my upbringing, and have created the backdrop for my appreciation of forests. Like the beautiful Victorian houses of the town of Monson, the trees on this hillside were the example of what forest is to be, like what an elegant house is. For the trees to have been ripped out like this is disorienting. Is this what it has come to? Are we to expect more and more of these tornados in the future? We know that tornados do occur in this area, but rarely. Does the dramatic increase in atmospheric carbon dioxide have an effect in this? This would be a good time to come out and study this tornado. Now that the bigger trees are down, there will be effects on the land. The ferns and herbaceous shade plants are yellowing in the hot sun. 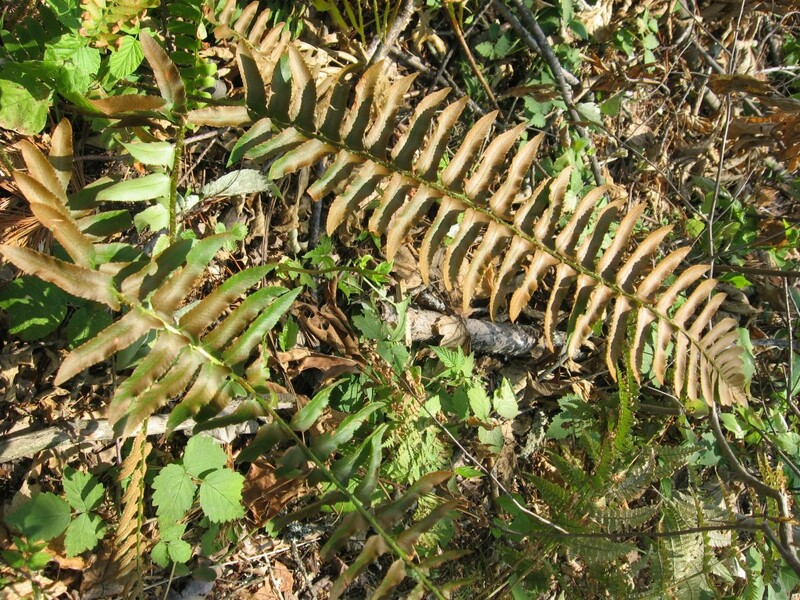 Here, Christmas fern (Polystichum acrostichoides) survived the tornado but is now exposed to so much sunlight, that it is turning brown. 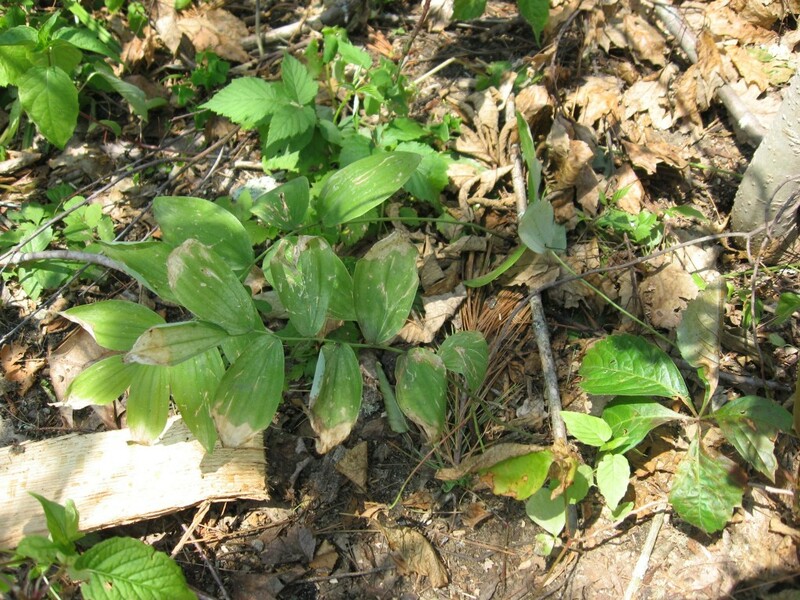 The woodland herbaceous plant, Smilacina racemosa, False Solomons seal, is also turning brown at the edges. (Top and bottom). Change has come to this forest, and how it will manifest itself is up for speculation. Please feel free to throw in your two cents as to how it will pan out in the next 5 years, ten, and how about 50 and 100! This tornado’s path will be still evident in 200 years to the close inspection. Many of the Oaks and Hickories will probably sprout new branches on top of the trunks and there will be some odd-shaped trees in 10 years, with thick trunks and lots of thin branches coming off the tops. Some of the wind-blown trees that have survived will be trees that have interesting angles and curves in the trunks, with straight tops. Many young trees have survived this event and they will grow into the new forest. Species such as birch and white pine may thrive in this new sunny environment, and they make take a more prominent place in the forest in the next twenty years. There will also be some surprises. Long dormant seeds may sprout and there may be species making a presence not seen in many years. 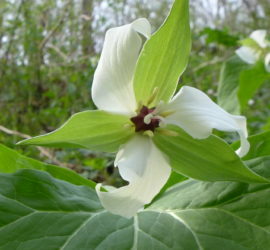 There will also be a possibility of invasive, introduced species gaining a foothold in this disturbed environment, such as the Asiatic bittersweet and Japanese Knotweed. This last picture illustrates the amount of dead wood that now sits on the land. This poses a fire risk in the next few years ahead. One dry summer with all of this dry wood sitting around and any number of fire possibilities creates a huge potential problem. 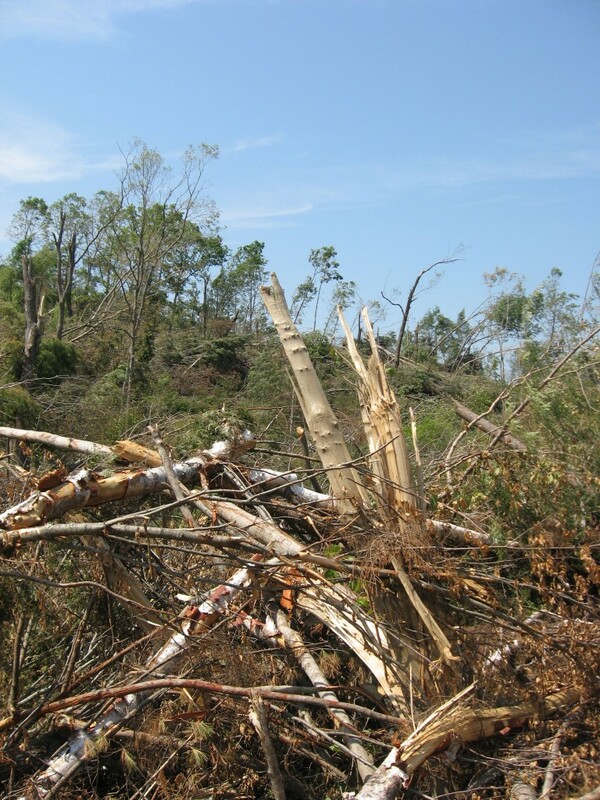 What can be done now to have a healthy forest regenerate, and for this to be a safe process? While the towns and city is re-built, the forest must also be considered. 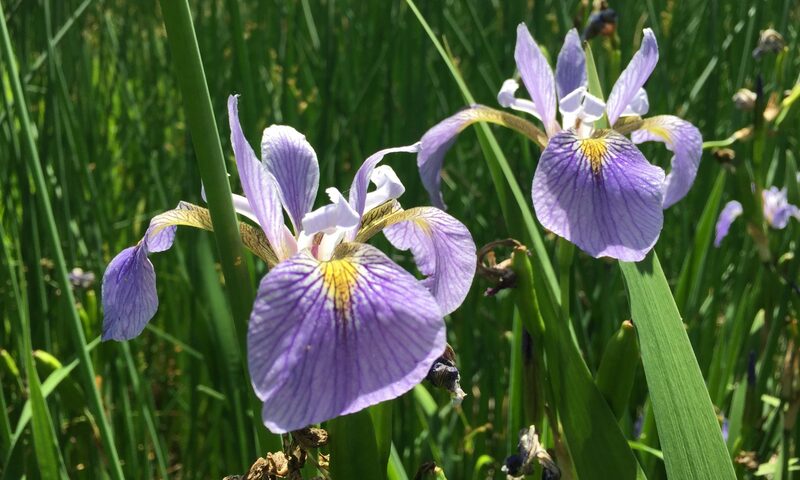 As difficult as this has been and will be, the re-building and decision-making of the towns and forests presents a unique opportunity for re-defining our role as citizens in a civic engagement as well as stewards of the natural environment we live amidst. EXTENT OF DEVASTATION INDESCRIBABLE AT THIS TIME. OVER 70 HOMES COMPLETELY DESTROYED. 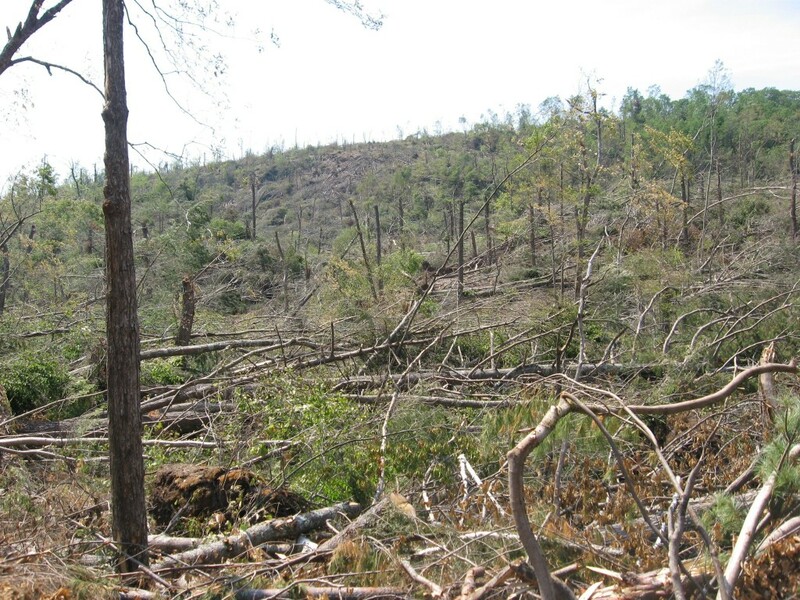 THOUSANDS OF ACRES OF FOREST LEVELED. 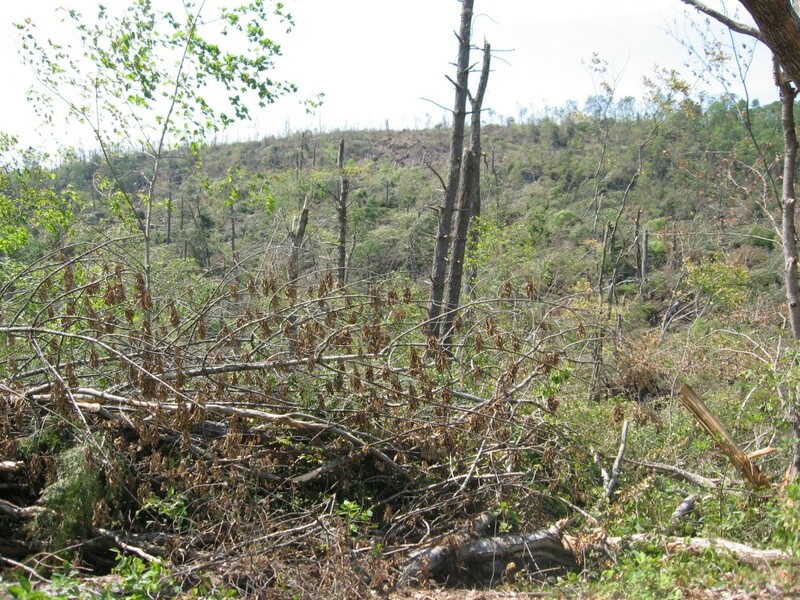 MASSIVE HABITAT LOSS IN 38 MILE LONG PATH OF DESTRUCTION. THREAT OF MASSIVE FOREST FIRE LOOMS FROM NEWLY CREATED “FIRE LOAD” OF THOUSANDS OF ACRES OF DEAD LUMBER NOW SITTING IN THE WAKE OF THE TORNADO JUST AT THE BREAK OF THE SUMMER SEASON. NOW IS THE TIME FOR THE ENTIRE TOWN TO RISE AND DEMAND FROM THE FEDERAL AND STATE GOVERNMENTS EVERY BIT OF HELP POSSIBLE TO REDUCE ANY FURTHER RISK OF DAMAGE FROM FIRE AS WELL AS DAMAGE FROM ANY WEATHER IN THE FORM OF IMMEDIATE AID FOR ALL PROPERTIES, BUSINESSES AND HOMES IN THE EFFECTED AREAS . 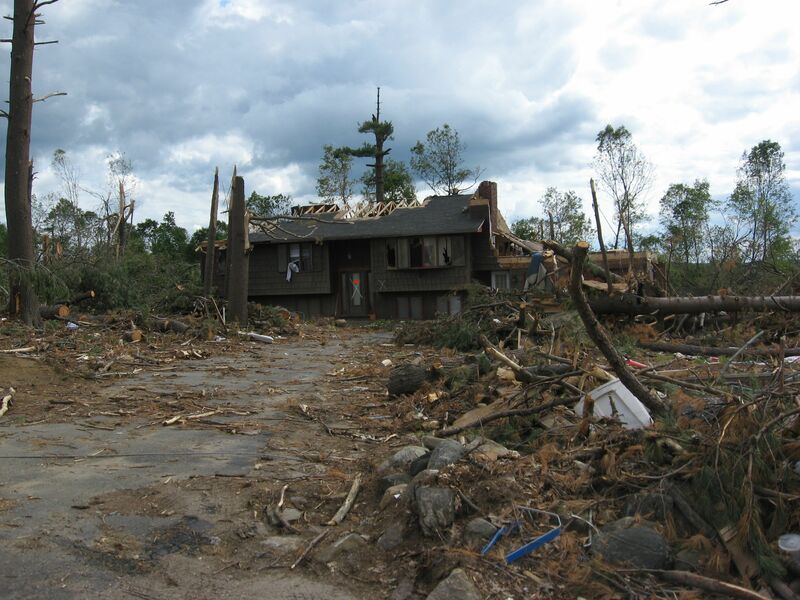 Special edition to the Sanguine Root- Staff writer Sean Solomon covers the devastating June 1st 2011 tornado that destroyed much of his hometown of Monson Massachusetts. This is the tornado. 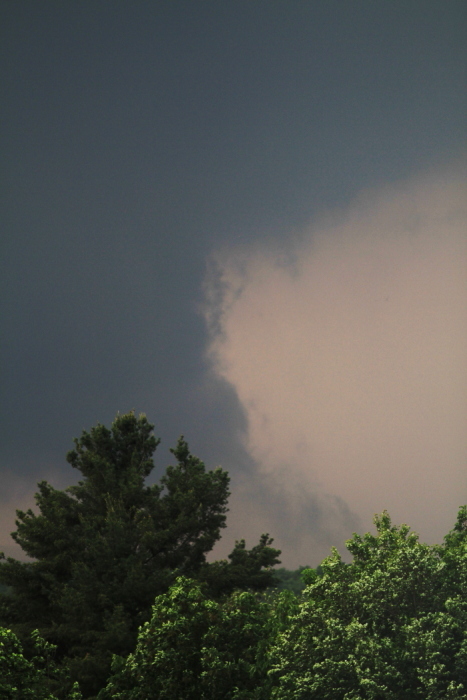 The funnel cloud is clearly captured in Brian’s picture (above), taken just two miles south of the tornado. 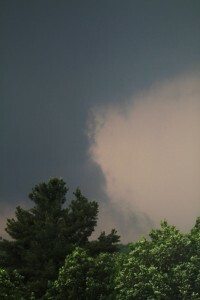 The funnel is whirling from left to right of the picture, whipping up such that the violent part of the tornado is not as dark as the top portion, as it has a rotation of extreme speed and a force that is unpredictable. When he took this photo, there was no way of knowing if this extremely dangerous high intensity rotational super-cell was headed his way. If it was, it would be a matter of minutes before it would tear apart the house and all of the vegetation around it. 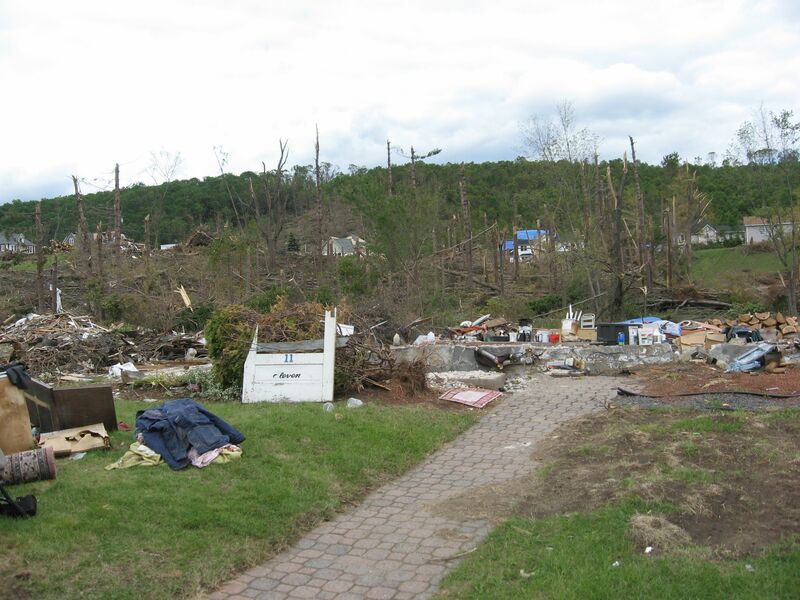 The path of the tornado remained just two miles north of the family home. This is Bethany Street. It was a charming tree-lined street lined with gracious Victorian- era houses. This one was pulled off of its foundation and left to crumple. The red placard was pasted on declaring its dangerous state. Unless every part of the house could be safely dismantled, stored and rebuilt on a new foundation with new structural members, this house is ruined forever. 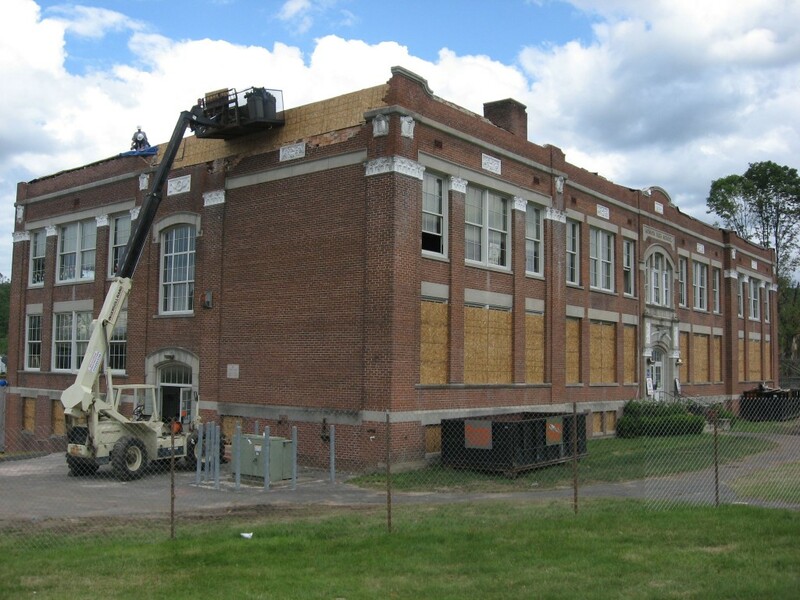 Much of the historic fabric of Monson is at stake. 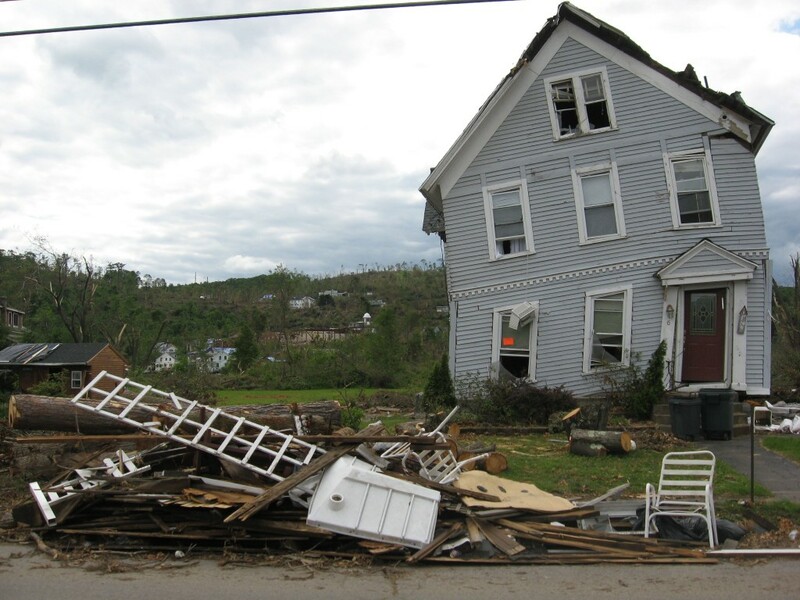 Ideally, the ruined homes could be re-built using salvaged cornices and door frames, and the size and placement of the windows, the proportions of the roof pitch and the cedar siding could all be replicated. This house was right across the street. 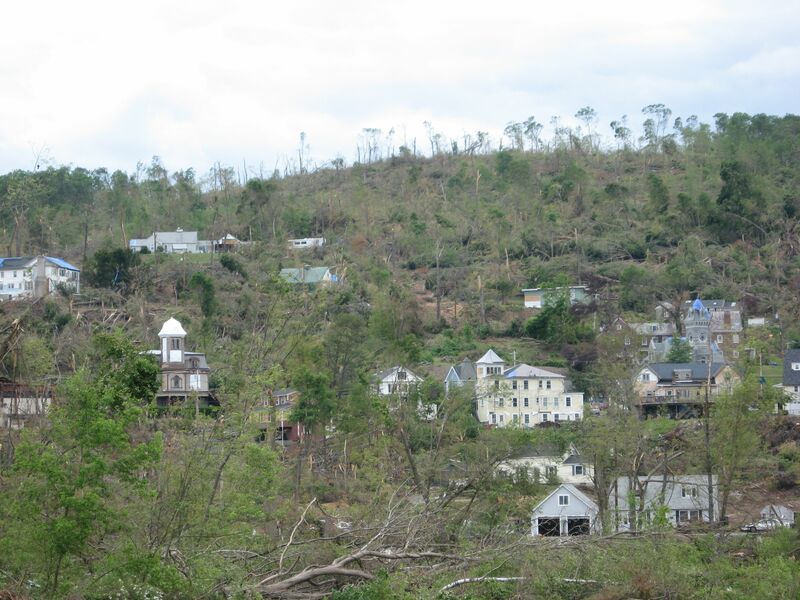 Here is a view of the remains of the town. The path of the tornado was about 1/4 of a mile wide here. It went up and down steep forested hills for 38 miles. Its wake of destruction appears more vigorous at the bottom of the hills . The next hill it climbed, it narrowed a bit and then widened to 1/2 mile at the bottom on its eastward path. 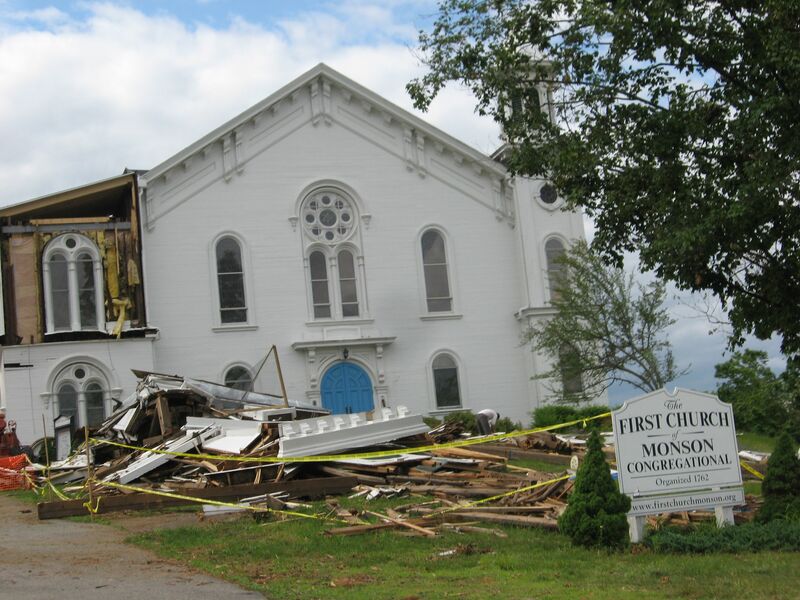 The iconic New England First Church Of Monson, with its steeple pulled right off. The lighting rod of the steeple pierced the wooden sign near the left hand yew. A volunteer building contractor was going through the rubble, pulling out the architectural elements for storage and re-use in a hopeful replication of the steeple. 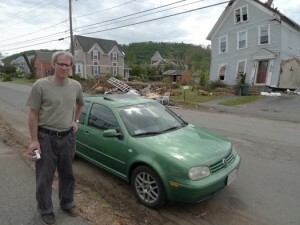 I suggested to him that the ‘blueprints’ for the envelope of the new steeple were right there in the pile. He said they hope to reuse as much as possible in the re-construction. The volunteer said that the clock mechanisms they found were intact. 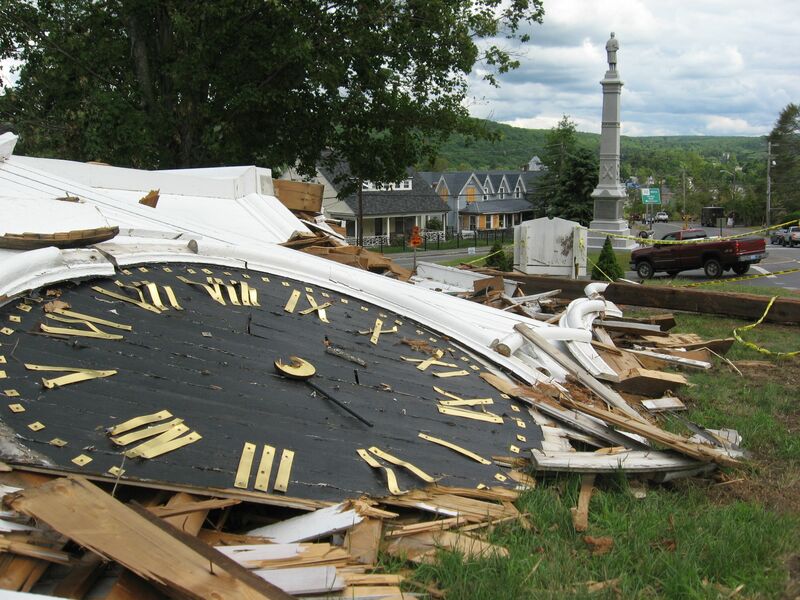 The hour hand remains at the time of the tornado. On my bike rides to school, I would use this clock to see how late I was. My old school. Since converted to the town offices, the future of the building is still uncertain. At the town meeting, we were told it awaits engineering reports. A home I visited in childhood. The house across the street from the house pictured above. 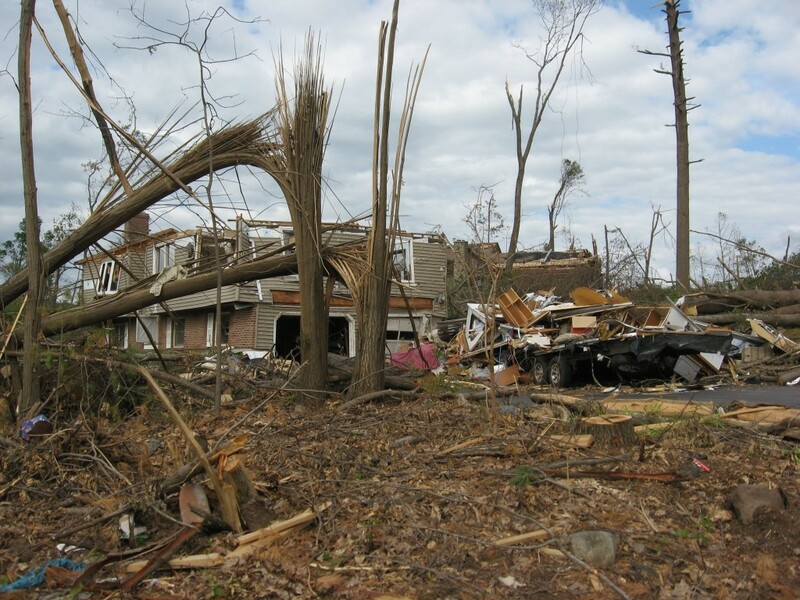 The destruction of homes and property, and lives and livelihoods is impossible to calculate. We must also account for the destruction of the forests of Monson, and the land effected: What are the effects on the forests, and what are the long term effects? It was said at the town meeting that one of the biggest losses people voiced was the loss of their trees. Houses can be replaced but mature trees cannot be any time soon. In the aftermath, there are many immediate things to grapple with, Food, clothing, shelter, mental well-being, Insurance, State and Federal aid. On accounting for the forests, one looming immediate issue is the fire load. The thousands of acres of dead brush and trees left behind. There is a ban on controlled burning, but in the coming months as summer heats up and things dry out, whats to stop a lightning strike, a tossed cigarette or an illegal fire? Is there a plan in place to minimize the fire load? Is there political will? Is this a job for a massive entity such as the Army Corps? If these dead trees and shrubs, the fire load, ignites, what will this conflagration do to the town? The town will need to be organized and vocal on a civic and grassroots level and to keep asking for help on this and many other issues. At this point there are more questions than answers.